Not all Americans fought against the British crown; many sided with and pledged their allegiance to the king. They called themselves loyalists; to them, our patriots were rebels. On Monday meet one of those loyalists; he will tell you of his side of the conflict, oft times at the cost of hardship and heartache to him and his family. How did the news of Lexington and Concord affect a small New England community? 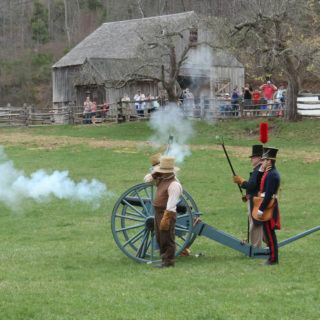 For a day of history, entertainment and discovery, visit Old Sturbridge Village on April 16 as we celebrate our nation’s beginning and continuing perseverance, in war and in peace. Patriots’ Day, celebrated only in the states of Massachusetts, Maine and Connecticut, commemorates the opening battles in the American Revolution on April 19, 1775. Patriots’ Day became an official holiday in Massachusetts in 1894. Maine, which had been part of Massachusetts until 1820, adopted holiday shortly after. Connecticut voted to adopt Patriots’ Day in 2018.